Cotswold Way gets on French TV !! A crew for the leading French TV Channel TF1 recently did some filming on the Cotswold Way for their news bulletin. They filmed walkers on a scenic part of the trail in the upper Swainswick Valley near Bath and then took shots in historic Dyrham. They also carried out interviews with walkers and the CWA chairman before heading off to London to interview French expatriates about Brexit !! 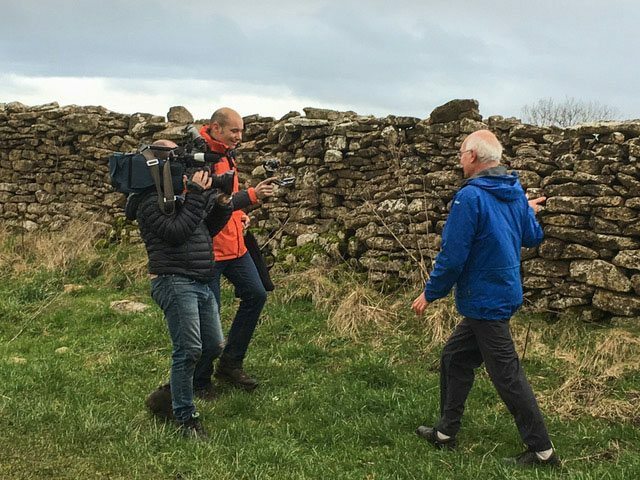 Here is a photo of an interview of a Cotswold Warden explaining about dry stone walls.